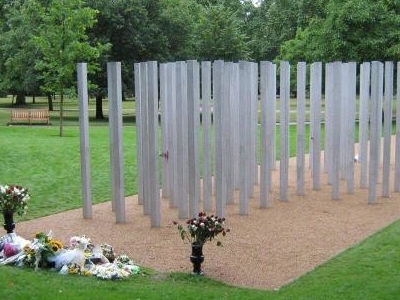 A permanent memorial to the victims of the 7 July 2005 London bombings is situated in London's Hyde Park. The Monument is made of 52 stainless steel columns (or stelae), each 3.5 metres tall. The stelae are grouped in four clusters that reflect the four locations of the bombings at Tavistock Square, Edgware Road, King's Cross and Aldgate East Tube Station. It was designed by a team including architects Carmody Groarke, in consultation with the families of the victims. The steel was cast by Norton Cast Products of Sheffield. The memorial was unveiled on the fifth anniversary of the attacks on 7 July 2009, at a ceremony attended by family members and relations of the victims and Charles, Prince of Wales, Prime Minister Gordon Brown, and other political leaders. The memorial was defaced with graffiti two weeks after its dedication ceremony in 2009, and for a second time in 2014, on the morning of the ninth anniversary of the attacks. In the 2014 incident slogans such as "4Innocent Muslims", "Blair Lied Thousands Died" and "J7 Truth" were painted in red and black on the memorial, and were removed shortly after by The Park's ranger. Here's the our members favorite photos of "Monuments near City of Westminster". Upload your photo of 7 July Memorial!